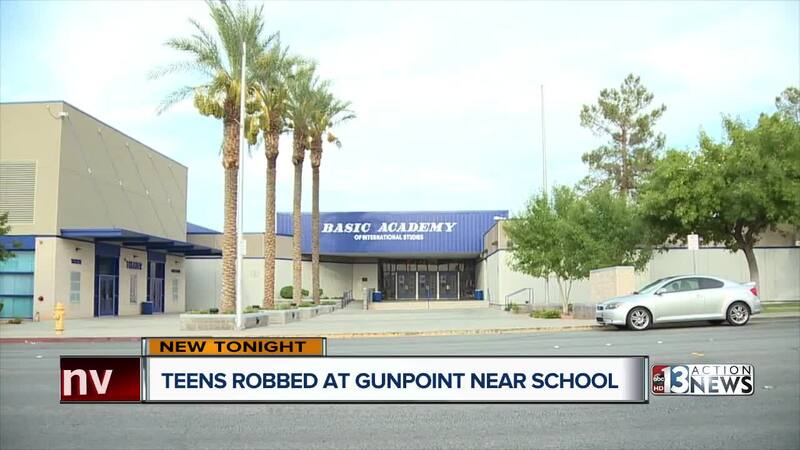 A mother is breathing a little easier after Henderson police arrested two suspects just hours after her daughters were robbed at gunpoint on their way to school. Police say the girls were walking to Basic High School early Thursday morning when two male suspects stole their cell phones. Officers say at least one of the suspects appeared to show a gun during the crime. The teens didn't report the crime until after they arrived on campus. "I couldn't believe what she was saying," Marquitta Jones said about the call from the school about the robbery. "The first thing I wanted to know was, were they okay, and when could I get to my kids." Neither girl was hurt, but the suspect did take off with their cell phones. Jones said it isn't something she ever expected her daughters to encounter on the mile walk to the Henderson campus and her first thought was about catching the robbers. "I wanted vengeance. I wanted to make sure they pay for what they did. My girls are good girls," Jones said. Luckily police said they were quickly able to track down the younger suspect who is also a student at Basic High School. He was booked into juvenile hall. Officers said they later arrested 19-year-old Daveon Samuels in connection with the robbery and found two BB guns during the investigation. Now Jones is just hoping other students and parents will learn from her family's ordeal and be extra careful and aware no matter their surroundings on the way to school.